GoSun is a young company comprised of designers, engineers, and change-makers, intent on serving the world with unparalleled green cooking solutions. They are passionate about their products and how they power their customers’ lives. They were founded in a small suburban garage by Patrick Sherwin. While volunteering with non-profit organizations in Haiti and Latin America, Patrick experienced first-hand the vulnerability of energy poverty. Touched by the resilience and happiness of those living on just $2.00/day, he spent years facilitating technology, energy and social innovations in the developing world. These efforts, including many failures to introduce typical solar ovens, led to the realization that his solar hotdog cooker invention could be something more, serving a great need in emerging markets. Since then, they started growing quickly and turned out to be who they are now - nourishing the good things in life and helping others do the same. Thanks to a community of committed customers, who not only believe in their products but also use them to bring people together. This company is not doing business - they are empowering people from the far-flung areas by teaching them how to use this modern technology, saving the forest as there is no need for coal to cook, and thereby changing lives. You can support their cause and avail of the GoSun Sport Pro® Pack, GoSun Sport®, GoSun Grill®, GoSun Station- Commercial Scale Oven, and Other Accessories. 1) How does this solar stove work? Remember how we were taught survival techniques and how people from the old times used bamboo as a pot to cook rice? That’s what this solar stove looks like - a tube. Only without the need for fire to cook. It uses the sun’s heat and traps it in a way that it stays in the stove for as long as you cook your food! 2) Can I cook even without the sunlight? Yes! Thanks to their patented thermal battery, you just need to charge it for 2 hours under the sun and you can still use it, even at night. 3) What can it cook? Bake, roast, steam and fry all your favorite food (except the really bulky ones like lechon)! Check out the GoSun Recipe Blog for mouthwatering food inspos! 4) Can I boil water using it? It is not recommended. But good news is they are currently in the final stages of manufacturing the GoSun Brew, their water boiling insert which will fit inside the GoSun Sport. 5) How much sun do I need to cook? Generally, the stove will cook quickly if you can see a defined shadow from your hand even when overcast, windy and in some cases rainy. If the clouds are thick, cooking is still possible, though it will take longer as the stove builds up heat during the sunny periods. It is suggested that you use a weather tracking app like My Radar to help plan and set you up for success. 6) Does the food cook evenly? Yes. The insulated tube guarantees that the temperature is the same all throughout the inside. 1) We can cook food anytime, anywhere, all the time - After hearing the news about fast-approaching Hurricane Irma, we packed everything we had for the mandatory evacuation. When we rented some temporary accomodation in Fort Lauderdale the power lines were still down, so we broke out the GoSun stove to cook our lunch with! 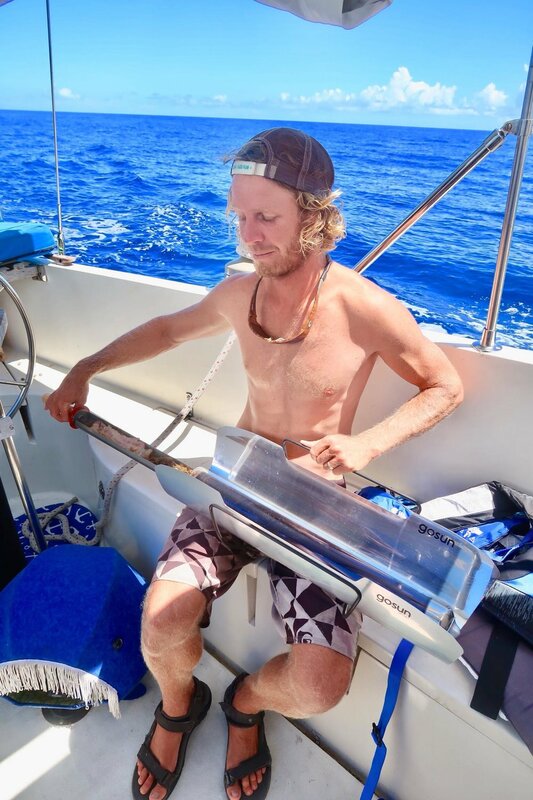 Our S/V Empress made it miraculously and when returned, our boat and stomachs are empty! It took us a while to move everything back in. 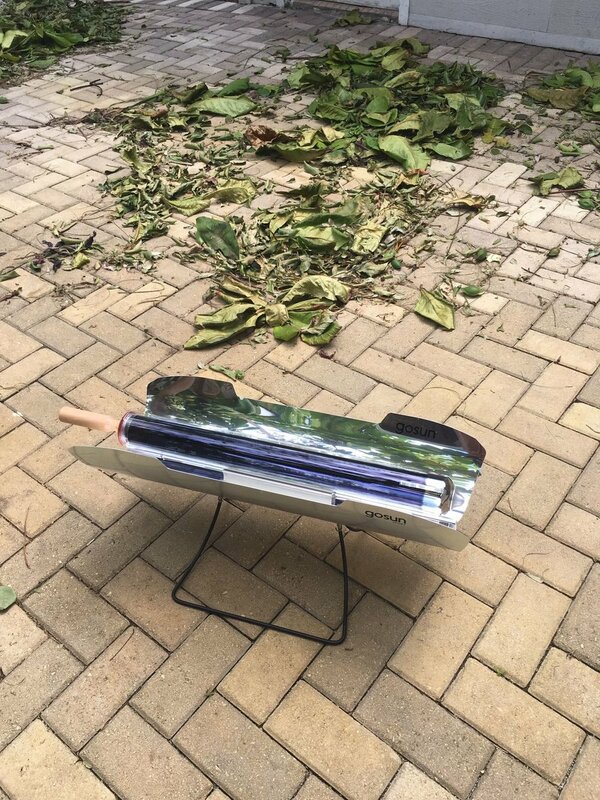 Luckily we had our solar stove, so we ate well in the aftermath of Hurricane Irma. We didn’t go hungry and we even managed to share some food to our live-aboard neighbours! 2) It is portable and lightweight - The reflectors and base fold into a sturdy 7.5lb clamshell case with carrying handles. We will always be backpackers by heart and we will definitely take this with us when we get into the wilderness again. 3) It is easy to use and it keeps the food’s natural flavor - I don’t really know how to cook but I’m starting to learn. Using this stove is really a good start as I just put everything inside and wait for it to cook. No monitoring required so I can do a lot of things on the side and I won’t have to worry about my food burning. 4) It is cool to touch - Since it doesn’t use any fire or fuel, we don't have to worry about fire, which is the biggest concern on a boat. The stove’s solar vacuum tube cooking chamber provides a near perfect layer of insulation, keeping heat in and cold out. 5) It’s a very good investment - For $359, I really think that it’s worth it. It doesn’t cost too much and they are true to what they say they are. They don’t exaggerate what the GoSun can do and are very clear about how to use it. 1) The tube isn’t big enough - With the narrow tube, we can't make several dishes simultaneously. The one we have is just perfect for two to three people eating a simple meal, or it can be used to cook one part of a larger meal. Having said that there is a larger model available which can cook a meal for up to eight people. So they have that taken care of as well! 2) It’s hard to know if the food is cooked - Except for the food’s delicious smell and their cooking guide (which doesn’t have everything), it’s hard to tell if the food is cooked. You can’t really see it until it’s cooked. Unless you open the tube which will only take cooking longer. This is something that we think we'll get better at with more experience as much as anything else. Overall, I’m giving the GoSun a 4 out 5. We love it and we love how their company is committed to Corporate Social Responsibility. They are one of the best in the market! There’s still a little room for improvement but we have already seen their products getting better and the range of accessories expanding the range of applications of the GoSun solar stove.